I am fortunate to spend this week learning about innovations in children’s residential services, including a two day workshop on how to serve children with autism who need residential placement. (which just ended!) This is a tough part of what we do. I’d love to live in a world where residential services were not needed (and things like our EIBI clinic will slowly reduce the number of children, at least with autism, who need it!). But the reality is that these challenging kids will not thrive if our “A game” is not dedicated to them, and yet they’re frequently an afterthought. I only half joke when I proposed an alternate mission statement to my boss, that we take the kids everyone else gave up on, and we change the rules so that they, too, may thrive. This is part of yet another weird paradigm shift for me in my career. Later this month, I’m sitting for the fourth and final phase of board certification in clinical neuropsychology (the ABPP system mirrors fairly closely the ABMS system in medicine, both systems recognizing specialists after they have completed the entire licensure process, to become psychologists and physicians, respectively). ABPP represents the culmination of a process I started 11 years ago to leave engineering (two years “catching up” on psychology via evening classes and learning psychology research at Wayne State University, four years at the University of Florida, a year at the University of Chicago interning and two years at Mary Free Bed Rehabilitation Hospital as a fellow, prior to my nearly two years at Hope Network). 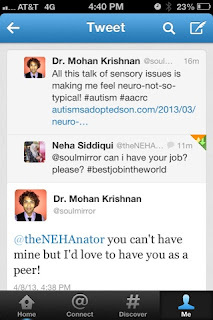 It’s been a long but tremendously rewarding road (and I agree with Neha’s tweet!). All this left me knowing neurological injuries, neurodevelopmental disorders, diagnosis, treatment planning, developing a research program, and collaborating with physicians in a hospital setting, like the back of my hand. I did not expect (almost a year ago) to also take on the responsibility of overseeing and leading children’s residential services alongside my outpatient autism program. I have a great team, including the residential program director, Niki, who is just awesome. But, I have had a lot to learn! And that includes a lot of things I wish I didn’t know about the bureaucracy that surrounds the residential world. However, I love to dive in feet first. So if I’m going to lead residential, I’m dedicating myself to leading it far into this 21st century. And, hopefully, still manage to pass my neuropsychology boards, which will have nothing to do with any of this! And thus, I came to New Jersey. 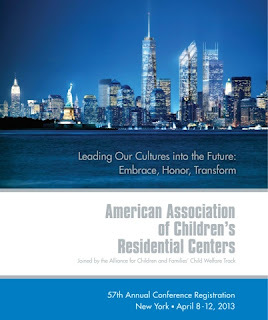 The American Association of Children’s Residential Centers is the nation’s premier organization in this area, and I want to learn from and with the best. I’m going to lectures not only autism but Trauma Informed Care, treatment and discharge planning, aftercare, integrating medical and behavioral care, and several other topics. As I mentioned, it all started with a two day autism fest. 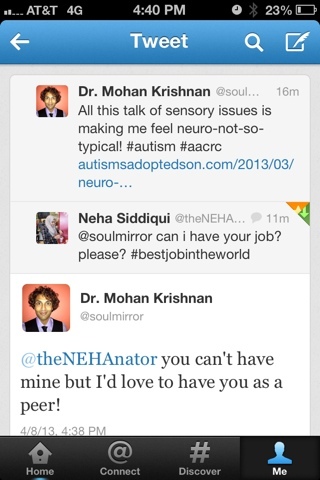 Which is, as Neha said, awesome. All-you-can-eat DRO, RIRD, and FBA (and you heard the way kids with autism speak can be repetitive and self-stimulatory!). Stimming / fidgeting toys at my table waiting for me at the lectures, too! I saw some great things that I’m taking home as I think about where I want our residential care to go next. I love that everyone here is very humanistic in their motivation to serve kids woth autism who need residential placement. Like us, they work hard to understand behavior based on the premise that, when the function of problem behavior is learned, new behaviors can be taught or the behavior can be treated, rather than the child being labeled as a “bad kid,” and us moving into punishing crimes. I respect our police, judges, and so on, but punishing crime cannot be what we do. One of the most consistent themes was a highly structured day, with organized transitions between activities, and play that hides teaching instead of excessive downtime. I think we do this well, but it’s a continual effort to do it better. I saw some great examples of how to push the envelope on structuring the physical space to make it more conducive to activity participation (while still being ruggedized for kids who destroy property!). Speaking of the physical space, one small but great idea I saw was to use one’s own body as the visual analog scale for frustration or anger (that is, a very calm level might be anger at one’s feet or ankles, a moderate level at their belly button, a high level a their shoulders). We’ve all heard someone say, “I’ve had it up to here with you!” Beyond all the great things that just systematically quantifying anger does, using the body as a scale is great because it is ever present. And I personally also love the idea of developing a confirmatory code language with our kids that fosters our mutual goals. They can say, “I’m at my waist,” and their meaning is perfectly clear to us, to their loved ones, and to and each other but opaque to people who don’t need to know. As if that were not enough, we have been working on using the Soles of the Feet mindfulness approach, researched specifically for teaching anger management to people with cognitive deficits. It seems to fit perfectly, and between the two techniques, we could really teach our kids to walk on water! I am sympathetic to the IT guys who are concerned about data security and respect HIPAA, but I really think we’ve got to move farther and faster to use solutions like Skype and FaceTime to not only connect kids in residential care with their family (which happens routinely) but also to do much more parent training, irrespective of distance, and for the kids where true family psychotherapy is possible, that as well needs to happen whenever it is clinically indicated, with distance as no excuse. I’ve heard about a couple of models of aftercare that I want to explore farther. We deal with children who come from very far away, and we’ve met before with some innovators in distance aftercare, but one of the simple ones I really like is a hotline system where kids who are discharged have a lifeline back to that one staff with whom they really formed a bond (our kids have this staff formally assigned as their “mentor”). One thing that bothers me a little is that only a few programs I’ve heard from really incorporate intensive behavioral therapy for skill acquisition (using either the applied verbal behavior framework, which our EIBI clinic uses, or the discrete trial training approach, which Ivar Lovaas and others pioneered). I don’t have a problem with sensory time in a residential program (and we do all kinds of sensory things, as reinforcers, just for fun, and for calming, even if I am not a proponent of “sensory integration”), but I really think this is the core of what we do for outpatient kids with autism, and I think using the residential environment to allow for this for kids who are not safe to remain in the community, too far from an outpatient clinic for multiple weekly visits, or simply have too much catching up to do, needs to be a big part of the focus. Somewhat aligned with this is that programs seem to vary widely on who they admit, when, and why. This is a known, broader problem, although with autism being a relatively more homogenous population than the entirety of all kids receiving residential care, I had hoped for more ideas on systematically driving this, both programmatically and in the advocacy arena. I think we all agree that multiple, simultaneous problems exist. There are kids who are kept in the community too long, to their detriment and to their family’s, who could have had better outcomes with an early residential, intensive treatment approach, that would give them a better long-term trajectory that keeps them in the community. For these kids, who come to us late, unfortunately the residential door frequently swings only one way. There are also kids who are placed residentially for whom not enough work is done to keep them at home. And, there are kids who are placed residentially, but critical thought is not applied to what therapies and services they need, and so residential care becomes an extremely expensive way of melt detaining them, rather than helping them transform their lives. I learned a lot of interesting things during the second half of the conference, which focused more on program design and providing high quality services to all youth in residential care. So far, I really like AACRC. I’m definitely thinking about getting more involved, and I would like to see if I can’t present at next year’s conference.